University Housing Services welcomes athlete and Olympic medalist Ibtihaj Muhammad as the featured speaker for the Muslim Cultural Dinner on Wednesday, April 3, 2019, at 5 p.m. in the Brown Ballroom of the Bone Student Center. Muhammad inspires others to challenge the status quo as a powerful symbol of America’s tolerance and diversity. As a member of the U.S. National Fencing Team, she jousted her way into the history books at the 2016 Summer Olympics in Rio de Janeiro by helping the women’s fencing team earn the bronze medal. In her new memoir, Proud: My Fight for an Unlikely American Dream, she details her unique journey to become the first athlete to compete in a hijab for Team USA. Join us as Muhammad shares how to stay true to oneself and still play by the rules. Dinner guests will enjoy a meal catered by Illinois State University Catering featuring a variety of cuisines popular in the Muslim faith. Tickets for the dinner are available here for $20, or meal plan holders may use a meal swipe to make a reservation in exchange for one meal. Tickets will be available online until March 26, 2019, or until sold out. Tickets will not be sold at the door. A special thank you to the following campus partners that assist in the planning and implementation of this event: Event Management, Dining and Hospitality, Association of Residence Halls, Watterson Area Government, Watterson Diversity Coalition, and the Muslim Student Association. Muhammad attended Duke University on a scholarship. 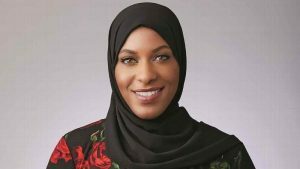 She graduated in 2007 with dual bachelor’s degrees in international relations and African-American studies with a minor in Arabic. During her first year at college in 2004, she earned All-America honors with a record of 49-8. From there, she went on to place second at the mid-Atlantic/South Regional and 21st at the Junior Olympics. The following year, she finished 11th for saber at the NCAA Championships, and earned her second consecutive All-America honors. A third would come in 2006. Muhammad also serves on the council for the U.S. Department of State’s Empowering Women and Girls through Sport Initiative, which encourages girls across the globe to reach their potential.